What happens when you combine the wonders of live music with the power of live theatre? Magic! Recently, over 3,000 public school children were treated to a special holiday gift – a look behind the curtain into the inner workings of a Broadway show. Inside Broadway has presented another wonderful production in its Creating the Magic series. This time, the show was Rodgers and Hammerstein’s magical “Cinderella” and the venue was the Broadway Theatre at 1681 Broadway. As the morning began, excited students piled into the theatre, many of them rushing to take a peek at the musicians in the orchestra pit. Even though protective netting prevented anyone from getting too close, it didn’t stop the kids from trying. When asked if they played music, many of the students gleamed with pride as they named the instruments they studied. To say they were excited to hear live music from live musicians would be an understatement. Inside Broadway’s executive director Michael Presser began the presentation with a short history of the Broadway Theatre, which was immediately followed by one of the numbers from the show. Spellbound, the children watched as the stage director and various crew members from the many theatrical departments – lights, sound, props, set changes, costumes – came out on stage to reveal the secrets of producing a Broadway show. At every Creating the Magic event, representatives from Broadway unions are invited to speak. Recording Vice President John O’Connor attended on our behalf to talk about Local 802 and the importance of live music. Later, the talented cast (Laura Irion, Andy Jones, Rebecca Luker, Laura Osnes and Kirstin Tucker) performed several more charming musical numbers from the show, accompanied by Local 802 members Brian Taylor (piano), Billy Miller (drums) and Mark Vanderpoel (bass), under the direction of musical director Andy Einhorn. After each number, Michael Presser interviewed the cast members to talk about their theatrical careers. 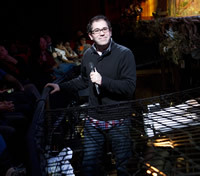 Andy Einhorn was then given the opportunity to address the audience from the podium, explaining the role of the music director in a Broadway show. The children were totally engaged, attentively listening to Einhorn talk about the music and the orchestra. The presentation concluded, aptly enough, with the song “There’s Music in You,” followed by a question-and-answer period. Most of the questions are usually directed towards the actors and sometimes the stage director and crew. This time, it was truly heartening to see so many of the children ask Andy Einhorn questions about being a Broadway musician. He was pleasantly surprised. “I particularly found myself encouraged that so many students had questions about how to become musicians on Broadway,” Einhorn said. And indeed, fun was had by all, especially the fortunate children who were privileged to see what it takes to produce the nightly miracle of a Broadway show. Thank you to the musicians and the creative team, and to Michael Presser and his dedicated staff as well as the board and patrons of Inside Broadway for giving everyone involved such a magical holiday gift. Finally, as reported in last month’s Allegro, Local 802 was recently asked to join the board of Inside Broadway. We’re proud that we are represented in this wonderful organization.